The election of conservative candidate Marcelo Rebelo de Sousa as Portugal’s new president on January 24 (with 51.99 per cent of the vote and a 48.84 per cent voter turnout) adds a new element to the existing ‘tripolar’ situation, which may be analyzed as follows. Jeronimo de Sousa (PCP), Catarina Martins (Bloco), Antonio Costa (SP). First, we have a Socialist Party (SP) government, serving alongside the newly elected president, presided over by the party’s general secretary (Prime Minister) Antonio Costa. Costa’s government is based on conditional parliamentary support he received from the Left Bloc (Bloco de Esquerda, in Portuguese) and the Portuguese Communist Party (PCP). However, the Left Bloc’s conditions differ significantly from those of the PCP. The PCP is, in turn, very different from the Left Bloc; for instance, it maintains close ties to the MPLA (Movimento Popular de Libertição de Angola) government of Angola, which controls that country’s wealth almost as if it were a family business. The daughter of Angolan President José Eduardo dos Santos, Isabel dos Santos, is among the key investors in the old colonial metropole where she enjoys the title of the “richest woman in Africa.” Furthermore, the PCP keeps up relations with the celestial bureaucracy of China, still referred to as ‘communist’ by hack journalists. These ties to the MPLA and the Chinese Communist Party flow not only from ideological affinity, but also through some material veins. For anyone who is following events in Portugal, it is therefore wrong to speak of a ‘bloc’ between the Left Bloc and the PCP. 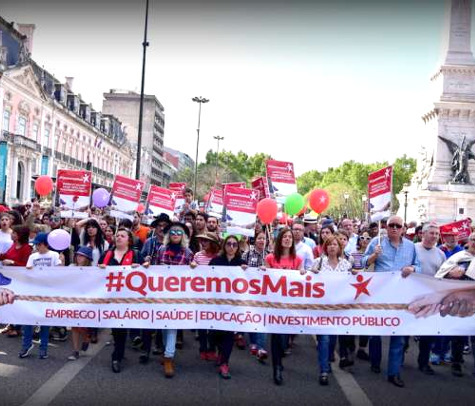 It may well be that the PCP will utilize pressure from sections of the CGTP (General Confederation of Portuguese Workers) in order to negotiate with the government. But the CGTP is extremely weak, especially since a layer of young people who mobilized last year to protest austerity has been forced to migrate to search for work. During the last few years, the population of Portugal has fallen by 5 per cent. This constitutes a socioeconomic hemorrhaging and a kind of reverse debt. That is, foreign capitalist economies actively seek out this young workforce, hard hit by unemployment and the crisis in agriculture, and whose education and training have already been financed, mainly by taxes on Portuguese workers themselves, for the super-exploited construction and cleaning sectors in France, Switzerland and Germany. The casualization of this forced emigration of the young, starting in 2010 and continuing in subsequent years, is perpetuated by classifying them as “guest workers,” according to the German formula. Many of these graduates are ‘employees’ performing tasks for which they are overqualified, but whose language skills make them ‘flexible’. They are, therefore, used as an underpaid workforce and as a useful lever for pumping out absolute surplus value (longer working hours) and relative surplus value (higher productivity and lower wages). Second, the European Union (EU) continues to insist, as it did at the February 11 meeting of EU finance ministers known as the Eurogroup, on the need to apply the rules of a stability and growth pact, previously signed by the Portuguese government, to the terms of the state budget for Portugal in 2016. The Eurogroup announced that it is waiting for verification of the 2015 state deficit from Eurostat (the official organ of the EU) in order to specify its demands. This took place while the budget was being debated line by line in parliament. With SP leader Antonio Costa at his side, Portuguese Finance Minister Mario Centeno stated that revenue and assets were the most important concerns for the governing team. And he declared that he was ready to take any necessary action after Jeroen Dijsselbloem, currently president of the Eurogroup, thanks to German Finance Minister Wolfgang Schäuble, warned that stability and growth pact “rules might require, if needed, Portugal be ready to do more to consolidate the state budget” ( Iinformação , February 12, 2016). This constraint imposed by the EU will be permanent, and it will increase. None other than Antonio Costa himself emphasized the fact that Portugal must remain in the eurozone, and that the final version of the 2016 and 2017 budgets must take this into account. And this is at a time when forecasts for economic growth rates are falling. Revisions for GDP growth have already dropped from 2.1 per cent to 1.8 per cent, which is clearly having an effect on state revenue, indirect taxes (VAT and excise duties on alcohol, tobacco, gasoline and diesel) chief among them. In fact, these sorts of taxes hit the poor and working classes the hardest because they are forced to spend most of their wages on necessities. Moreover, according to a recent survey published in the Diario de Noticias on February 10, 83.4 per cent of employees are currently earning less than 1,500 euros per month. However, their median gross income, calculated by dividing this 83.4 per cent into two equal parts, 50 per cent above and 50 per cent below, is just 785 euros. So it is easy to imagine a budget that, along with a very important debate about the allocation of resources, will also have to address differentiated taxation on income. The current budget under debate would require workers with a declared income of 800 euros a month to actually pay more than workers earning 1,500 euros or more. The Left Bloc’s national deputies spoke out strongly in order to correct this unequal tax. Third, President Rebelo de Sousa, as shown in an article by Manuel Loff in Publico , is a descendent of the fascist political regime created by António de Oliveira Salazar, who ruled Portugal from 1932 to his death in 1968. The regime itself remained in power until it was overthrown during the 1974 Carnation Revolution. Rebelo de Sousa intervenes sharply on social questions, ironically labeled “divisive” issues in Portugal, such as euthanasia or the right to abortion, while his policies are endlessly reinforced in the television and print mainstream media. Parliamentary battles are also reproduced in newscasts and in televised confrontations, creating a brutal and deafening media encirclement. What’s New in the Political-Institutional Organization? It is impossible to think about the present political dynamic without taking into account three additional elements. First, the formation of a new government, after a long debate and various attempts by the right to stop it, thanks to the PS-Left Bloc agreement and the support of the PCP, came into being, as journalist and Left Bloc leader Jorge Costa puts it, as if by magic. Among those who could remember back to the 2005-11 government of SP Prime Minister José Sócrates, relatively few could be expected to put their faith in a new SP-led government, especially since Sócrates himself is currently under investigation on corruption charges. Yet the government of Antonio Costa, which arose out of a public debate sparked between his faction of the SP and Left Bloc spokeswoman Catarina Martins on the one hand, and the achievement of a left-wing parliamentary majority owing to the PCP’s votes on the other, appeared unexpectedly and sparked hope among a layer of the popular classes. An apparently paradoxical attitude emerged from this context, one marked by a profound social crisis: First, there were hopes that the government might take steps, even very limited ones, towards ameliorating social conditions; and second, left-wing supporters of the government feared failure and worried it might not even survive 100 days, leading to a worsening of the situation. Second, at least for now, the political landscape lacks social movements of a certain size and power. However, ongoing austerity, and measures that may bite more sharply in the future, could give rise to anger whose political-institutional repercussions are unpredictable. Likewise, discontent among intermediate social sectors, such as the truck drivers who are suffering through a veritable economic guillotine, 3,000 small transportation businesses failed since 2012, could touch off destabilizing actions. The debate over public health has certainly demonstrated such opposition among caregivers and has brought many problems to the surface, including on-the-job conditions for health care workers, nurses and doctors, 65 per cent of whom work in public hospitals. Added to all this are huge bank scandals breaking in the wake of the collapse of Banco di Santo Spirito, whose luxurious headquarters in Lausanne was recently shuttered. The banking crisis required massive state budget expenditures to bail out investors, including Chinese and other foreign investors, and there is a similar maneuver underway in the energy sector. This could lead to pent-up anger exploding and unleashing a popular response. In this context, it is important to address the numeric weakness of the CGTP as well as critique its political and social orientation in the context of early 2016. Clearly, it has suffered from a decline in membership; but it is also hampered by a sort of detached, Pavlovian perspective based on past expectations, leaving it ill-prepared to face the unexpected rise of a PCP-backed government. This has opened up a public debate in advance of the union’s national congress about its links to the PCP. But even if we recognize the inadequacy of the traditional labour movement in the face of anticipated austerity measures soon to be adopted by the government, either little by little or more precipitously starting in May 2016, the unions, even if in a reduced state, still embody an important organizational experience. This potential can be glimpsed among dockworkers, bank and insurance employees, the hospital sector and call-center workers. On the other side, the defeat of the TAP state airline union is also rich in ‘lessons’ to be carefully studied, especially in the context of the international aviation sector. 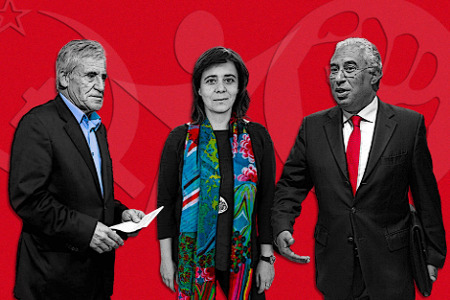 Third, Portugal’s constitutional arrangement makes life complicated for the big parties, both the SP and the CDS-PSD centrist-conservative coalition (People’s Party and the Social Democratic Party). Even Assunçao Cristas, the only figure running for leadership of the CDS in the party’s upcoming March 12-13 convention, had to recognize this fact. Soon after the attempt to form a government by then-sitting conservative Prime Minister Passos Coehlo collapsed in the fall, political journalist Manuel Agostinho Malgalhaes picked up on a statement by Left Bloc leader Pedro Filipe Soares, who argued that “the arc of government has been overcome by the arc of the constitution. Casting a so-called ‘useful vote’ today is an obsolete electoral argument” ( Sol , February 13, 2016). The term “arc of the constitution” may be unclear, but it must be set in the context of the governmental crisis facing then-president Anibal Cavaco Silva (CDS-PSD) who was trying to accentuate the crisis in the media as a way to whip up opposition to the attempt by SP leader Antonio Costa Pinto to form a left-wing government. As we have seen, Costa’s SP government could only take office by attaining a parliamentary majority with support from the PCP and the Left Bloc, but this maneuver required the parties to agree to a minimum program according to the rules of the constitution. Once this agreement was reached, Costa, who is a professor of European Politics at the University of Lisbon, stated, “There are few ideological points contained in this accord. But the real problem is that the next government is in a very difficult position. 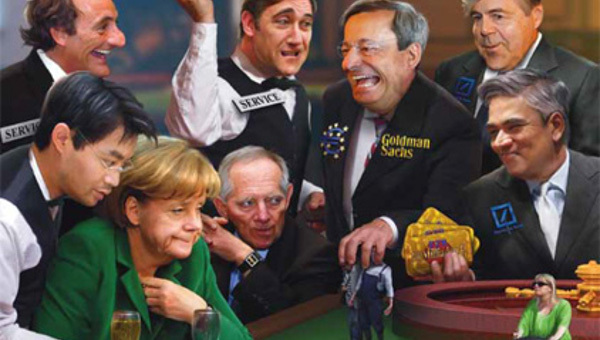 What happens if growth does not meet expectations or interest rates change?” ( Le Monde , November 9, 2015). However, in addition to the lack of growth, the multiform crises hitting the European Union and the spreading war in the Middle East are going to assert themselves in parliament and in the lives of the country’s popular majority, raising concrete difficulties between the Left Bloc and the Costa government. For instance, the tight relationship between NATO and the Portuguese military was on display during the Trident Juncture naval exercises in 2015 (the biggest NATO exercises since the end of the Cold War), which were designed to “demonstrate” NATO’s renewed ability to defend maritime facilities. The SP supports remaining in NATO while the Left Bloc has pledged to leave it. Managing this conditional agreement will be a complicated task. The left parties’ connections with popular sectors, whose desires can sometimes be interpreted all too easily in such a way as to conform with the leadership’s momentary political tactics, can see the tables turned by sudden acts of defiance. This is especially true as Costa’s available political choices, whose correct selection and prioritization are, in their own terms, a critical element of putting class politics into practice, will be limited in the current phase, placing the government under pressure. Moreover, the government’s political choices must be audible to potentially active sections of the working classes as well as to those sections who have already been activated, albeit in a limited and fragmentary manner. The capacity to organize certain social sectors, responding at critical moments in a timely manner, must be a driving force for a government, like Costa’s, with its back against the wall. Thus, if the “useful vote” blackmail, that is, the attempt to limit the number of votes cast to the left of the PS in favor of the Left Bloc or the PCP, has failed at this time, it remains to be seen what key political issues constitute this “pragmatic” agreement between the Left Bloc and the Costa government. In terms of this specific government’s “power” to manage, and it must be kept in mind that the PS has not departed from the current options employed the “Europeanized” social democracy, it is balancing on a fulcrum that is dependent to a large part on the choice by the Left Bloc to remain in the configuration initiated by the signing of the multiparty pact on November 26, 2015. 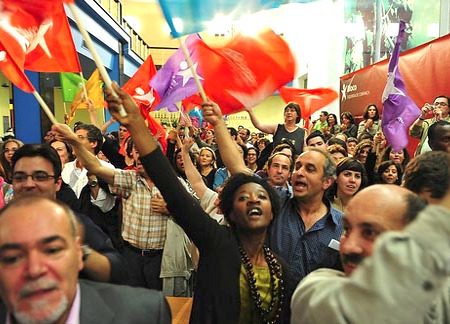 Pursuing a concrete tactic of polarization with the PS, the Left Bloc’s task is to promote a re-politicization process of what some have called the “people of the left” and of potentially emergent social movements. This tactic is, in fact, understood by an active section of the working class and is based on rank-and-file demands and political symbols. This re-politicization of legislation can be seen in increased interest taken by popular sectors in concrete proposals being debated in parliament. At least for now, that is, even if certain soccer teams still get more attention. The political conjuncture may accelerate with the concomitant economic crisis and unforeseen explosions of anger, or it make develop out of partial labour or community struggles that gain traction in the media and which are able to insert themselves into the political agendas of the government and parliament. These dynamics will emerge despite the attempts and practices of the government to apply cutbacks under various guises, by presenting them as inevitable, given pressure from the EU and the conservative president’s ruling circles. These will no doubt be presented bit by bit, as thinly sliced and easy-to-swallow bits of salami. 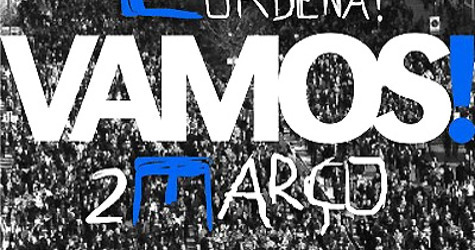 Several months along, the Left Bloc’s political dynamic cannot be reduced to what sectarian know-it-alls are proclaiming, among them certain Trotskyist currents with roots in Argentina who are politically exiled in Europe. Thus, in the daily paper Sol on February 13, there appeared an article titled, “Bloco is already more like SYRIZA than expected.” It emphasized that “the praise once paid to SYRIZA has been erased from their speeches.” Yet the same daily confirmed the distance the Left Bloc placed between itself and SYRIZA, despite the efforts of Yanis Varoufakis to curry political favor with Marisa Matias, the Left Bloc’s presidential candidate. The results of January’s presidential election confirms this dynamic: Marcelo Rebolo de Sousa (CDS-PSD) won 2,403,879 votes or 51.99 per cent; Antonio Sampaio de Novoa (a liberal academic backed by a small Maoist party running as an independent) won 1,058,705 votes or 22.90 per cent; Marisa Matias (Left Bloc) won 468,414 or 10.13 per cent; Maria de Belém (Green) won 196,105 or 4.24 per cent; and Edgar Silva (PCP) won 182,462 or 3.95 per cent. This goes to show how important the Left Bloc’s choices are going to be in the coming phase. This includes strategic and tactical decisions that reflect debates that are emerging in Greece and Spain, despite clear differences with those forces. These questions constitute the elements of a “European” political puzzle. It would be misleading to draw a simple line that merely attempts to concentrate an assemblage of mixed-up generalities. This sort of method simply exposes one’s ignorance of the concrete dialectics at play, including multiple and unequal developments in Europe, and in the EU, which is not quite the same thing. These specificities are burrowing their way through concurrent economic and institutional crises, while their common traits, in what is only an apparent paradox, express themselves in a more or less subterranean manner. This article analyzing the recent Portuguese elections was originally published in French. Todd Chretien translated this slightly abridged version and originally published on the Socialist Worker website. Charles-André Udry is a member of Movement for Socialism in Switzerland and editor of the A l'encontre website.